The latest technique in cataract surgery eliminates the need for uncomfortable injection of anesthesia behind the eye and bothersome, sometimes troublesome sutures. This is an improvement over current methods, offering the patient impressive benefits – safety, less time in surgery, relief from the usual discomfort and stress, less risk of complications and improved likelihood of success for an operation already known for its high success rate. With this procedure, the eye is anesthetized by eye drops instead of by injection. This approach not only eliminates the uncomfortable sensation associated with injection, but also eliminates complications that can be induced by injection. These complications are rare, but can be serious, such as permanent loss of vision, bleeding or hemorrhage behind the eye and the temporary cessation of breathing or heart beat. Omitting injection is more convenient for the patient who may be on anti-coagulation medication, and spares the patient the unpleasant experience of emerging from surgery with a “shiner”. The incision used in the latest technique is so small that no sutures are required. Older techniques for extracapsular cataract extraction, with lens implantation, require a comparatively larger incision. Then stabilizing sutures are generally used under the muscles of the eye to hold it still for surgery. Patients undergoing the newer procedure receive only half the normal amount of tranquilizer prior to surgery because they must cooperate with the surgeon to assure success. The patient is awake, but feels no pain when the ophthalmologist makes a tiny incision into the white part of the eye usually covered by the upper lid. Use of the eye drop therapy is possible only because of the small incision. The cataract is removed, using ultrasound and suction, through the very small incision. This incision is crafted in such a way that it becomes self sealing, thereby requiring no sutures for closure. 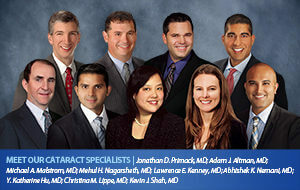 Then an intraocular lens is implanted behind the iris in the back of the eye. After the lens is implanted, the eye is repressurized with a special solution to make sure the wound is closed and leak proof. The patient’s usual medications need not be altered prior to surgery. They can be taken with a swallow of water just before the operation. Anti-coagulants are not stopped. Diabetics are asked to not take their diabetic medication by mouth or insulin injection the day of surgery. The insulin-dependent diabetic receives a modified dose after surgery, prior to the first meal. The patient may then return to their usual routine the next day. Injectionless, sutureless cataract surgery is not appropriate for the younger or anxious patient because the procedure does require good cooperation. It is not recommended for the individual who is unable to cooperate, or the patient whose surgery is likely to be complicated.